I've been using the excellent spriters-resource.com. For the Sylvester demo I used this one. I'm not sure where to find / see the original animation, so out of the 7 frames, I selected 5, and rolls back and forth (1,2,3,4,5,4,3,2). If Sylvester stops walking I set the frame to the first one (looks as if he stands still). There seems to be a frame where he raises his hand, and another where he may be leaping. Also I reduced the colors to use only black and white, so the red nose turned black. Edited by sometimes99er, Wed Sep 14, 2016 4:05 AM. 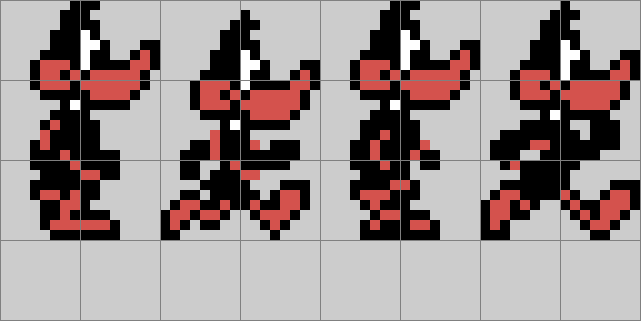 For the Daffy Duck demo I used this one. No compromise on number of colors. At first glimpse the animation almost seems to only consist of 2 frames. There are 4 though. The size is 16x24 pixels. 3 double-sized sprites at the top and 2 sprites below. This would allow for other moving sprites in a game (on the same horizontal lines). Edited by sometimes99er, Wed Sep 14, 2016 9:54 AM. For Bugs Bunny I used this one. 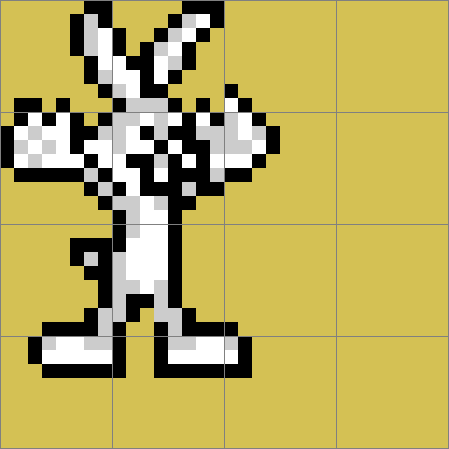 The black outline is background characters, and then 4 double-sized sprites horizontally (at the top and only 2 below), - so I had to find somewhere with no carrot outline sprite interference (with respect to the maximum of 4 sprites horizontally). Edited by sometimes99er, Wed Sep 14, 2016 11:49 PM.